The International Atherosclerosis Society is very pleased to announce an exciting new and informative Newsletter for its membership: The IAS Statin Newsletter. The IAS will begin this month providing curated update on all publications involving statins as identified in PubMed. Statin publications have been targeted because of the fundamental role of statins as agents to reduce atherosclerotic cardiovascular disease (ASCVD) risk. The service aims to address the needs of health care professionals globally who manage patients with or at risk of developing ASCVD. It is with great honor that I start serving as President of the International Atherosclerosis Society (IAS) for the three-year term beginning in January 2019. Thinking of all that my predecessors accomplished, I realize the importance of the role I am assuming, and find it quite a challenging one. The IAS aims to prevent cardiovascular disease, one of major causes of death worldwide, by playing important roles in coordinating the exchange of scientific information among the IAS constituent societies and fostering research on the prevention of atherosclerosis. In particular, the IAS has acted to foster education and communication globally among researchers, educators, and healthcare professionals in the field of atherosclerosis and cardiometabolic disorders. I am pleased to announce that the IAS is now on social media. I am pleased to announce that the International Atherosclerosis Society is launching The Wael Al-Mahmeed & IAS Research Training Grants and Fellowships for the MENA Region project. The entire IAS Board is honored and grateful to announce that this high-level initiative has been made possible by a generous donation from Dr. Wael Abdulrahman Al Mahmeed (Abu Dhabi, UAE). The Wael Al-Mahmeed & IAS Research Training Grants and Fellowships for the MENA Region is a competitive research funding opportunity aimed at advancing clinical and basic research in atherosclerosis and related cardio-metabolic-cerebrovascular diseases in the MENA Region, as well as promoting partnerships among researchers from recognized MENA Universities and healthcare institutions. •	Implementing ongoing research in the applicant’s laboratory. The Wael Al-Mahmeed & IAS Research Training Grants and Fellowships for the MENA Region will award up to three $10,000 grants for a maximum period of 6 months. The final granted amount will be calculated pro rata, according to the length of the certified training period or the duration of the research. The IAS Nominating Committee, chaired by Philip Barter (Australia) and composed by Anne Goldberg (USA), Chris Packard (UK), and Brian Tomlinson (Hong Kong), has presented the IAS Council the final slate of the candidates to be elected during the ISA2018 congress in Toronto. The Council of the Constituent Societies has elected the future Board members during its meeting on June 11, 2018. The International Atherosclerosis Society (IAS) and Oman Society of Lipid & Atherosclerosis (OSLA) are organizing the Fifth IAS-OSLA Course "Lipid Metabolism and Cardiovascular Risk" to be held in Muscat, Oman, on February 8-11, 2019. As in 2015, 2016, 2017 and 2018, the aim of this Course is to increase the knowledge and experience of early- to mid-career, English-speaking practicing clinicians interested in the management of lipid disorders and will be restricted to 30 clinicians practicing in the Middle East and North Africa (MENA) region who manage patients with lipid disorders. We wish to thank all who submitted an application. We have received tens of them, all of very high standard. The selection has not been easy: at the end of the selection process 34 participants have been chosen, representative of almost all the MENA Region countries, with good male to female ratio and different specialty. Raul Santos (President-Elect, IAS) and Khalid Al-Rasadi (President, OSLA) and was organized by the International Atherosclerosis Society (IAS), the Oman Society of Lipid and Atherosclerosis (OSLA), and the Gulf Heart Association Lipid Working Group (GHALWG). This interactive Course was accredited by the Oman Medical Specialty Board (OMSB) and was open to physicians practicing in the MENA Region. The FH Foundation announced that an important consensus statement on diagnosing familial hypercholesterolemia (FH), a common life-threatening genetic condition, was published online in the Journal of the American College of Cardiology. Authored by an international panel of 30 cardiovascular, lipid, genetics and advocacy experts and led by the FH Foundation, the statement recommends that genetic testing be offered to diagnose both individuals with FH and their relatives. FH genetic mutations lead to heart disease and stroke risk during the prime of life. Genetic testing of at-risk individuals holds the promise of accelerating the identification of over 30 million people worldwide born with FH, 90 percent of whom are currently undiagnosed, to ensure early treatment. Read more here. The IAS Severe FH Panel, made of 25 internationally renowned experts and chaired by Dr. Raul Santos, worked with the objective of characterizing the severe FH phenotype and made recommendations on how to stratify CVD risk and to whom to prescribe the novel lipid lowering treatments. These recommendations will contribute to improved daily clinical practice and better management of FH patients. To download the full text, which is open access, please link to and register at http://www.thelancet.com/journals/landia/article/PIIS2213-8587(16)30041-9/fulltext (Published online May 27, 2016). For more information about The Lancet, please visit The Lancet Homepage at www.thelancet.com. The ScreenPro FH Project started in 2014/2015. Based on the Czech MedPed experience the project was established for screening, diagnosis and treatment of FH patients in the region of Central, Eastern and Southern Europe. We started with 8 countries, now we are 20. We started with 70 centers, now we are 181 (other 40 in development). We started with 7500 patients in the local databases, now, they are 23 191. We started cooperation with patient´s organization in 8 countries (2017). We focus on education, screening and care of FH patients. Nowadays we are on the way from description of the situation to improvement in the treatment. The success story deriving from the educational activities of the IAS and OSLA in the MENA Region continues. Thanks to the efforts of Dr. Mutaz Alkhnifsaw and his Iraqi colleagues at the moment 11 Lipid clinics have been established throughout the country. Dr. Mutaz Al-khnifsawi, the President of the Iraqi Lipid Clinics Network was invited by the Federal Ministry of Health in Iraq to attend the first meeting between the Network and the Ministry to support the mission of improving health care for FH patients in Iraq and improve the quality of early diagnosis and treatment of this genetic disorder. The Iraqi Lipid Clinics Network announced the launch of the Iraqi national pediatric FH screening program in collaboration with and under the auspices of the International Atherosclerosis Society in two cities in Iraq , Diwaniya and Al-Samawa) for early diagnosis and treatment of familial hypercholesterolemia in Iraq. Under the auspices of the International Atherosclerosis Society , the Iraqi Lipid Clinics Network established the first lipid clinic in the Iraqi capital Baghdad: the lipid clinic will provide health care for Familial Hypercholesterolemia patients (Early diagnosis and proper treatment). Dr. Khalid Al-Jumaily the vice-president of the network will run the Clinic in Ibn- Al-Nafees Cardiac Hospital. The project is sponsored by Al-Mamourah scientific bureau in Iraq. May I share with you our latest activities in the field of FH detection, awareness and treatment. In Erbil , the capital of Kurdistan territory in the north of Iraq (400 km to the northeast of the capital Baghdad, We launched the national pediatric FH screening program in collaboration with the health authority in Erbil (Raparin Pediatric Hospital). Erbil is the third city in Iraq we launched the program in. Assistant professor of pediatrics Dr. Lana Mohammed was nominated to be the project manager there. National Pediatric FH Screening Program is one of the projects established by the Iraqi lipid clinics network. Dr. Mutaz Al-khnifsawi, president of the Iraqi Lipid Clinics Network, participated recently in a workshop held in Cairo, Egypt. The participants were a group of Egyptian university students, newly graduated males and females, as well as some Iraqis living in Egypt. The workshop focused on Familial hypercholesterolemia/FH (prevalence, risk, how to diagnose, how to treat, the importance of early detection and cascade screening) is part of the IAS-OSLA campaign, established in Iraq several months ago to raise public awareness about Familial hypercholestrolemia, The presentations by dr Mutaz used a simplified language to better transfer the messages and included short videos and also photos of FH signs. A stimulating and interactive discussion followed the presentations. Dr. Mutaz Al-khnifsawi, participated recently in the FH Global Summit in Los Angeles, CA, USA and delivered an FH awareness lecture about the prevalence, risk, importance of early diagnosis and cascade screening for some Iraqis and middle east people living in California, USA in their mosque after the night pray time was given. In September 24th 2018, The Iraqi lipid clinics network celebrated the FH awareness day in which a sample from the Iraqi people in Al-Diwaniya city 200 km to the South of the Capital Baghdad include various layers of the community (Solider, Engineer, University Students, Journalists, Doctor and Pharmacist, Nursing Staff, Educational Staff in Schools, University Professors) met together to listen to our talk about FH (Prevalence, risk, signs of the disease, the importance of early diagnosis and cascade screening of the family) in a simplified native language that included photos and short videos illustrating the impact of the problem. This event was followed by Radio broadcast in the local radio station of the city that was published on social media which talk to the whole Iraqi people about FH. Dr Mutaz Al-khnifsawi, President of the Iraqi Lipid Clinics Network and Dr Mohammed Asamawa, Secretary of the Iraqi Lipid Clinics Network have been very active in rising awareness on familial lipid disorders among the Iraqi medical community and the population. Risk factors for atherosclerotic cardiovascular disease (ASCVD) are variable among patients with Familial Hypercholesterolaemia (FH). SAFEHEART is a multicentre, nationwide, long-term prospective contemporary cohort study of a molecularly defined FH population with or without previous ASCVD. A robust risk prediction equation (SAFEHEART-RE) has been developed using this unique cohort that shows that the risk of incident ASCVD may be estimated in FH patients using clinical and laboratory parameters including age, gender, history of ASCVD, blood pressure, body mass index, smoking, and plasma LDL-C and lipoprotein (a) levels. The Harrell's C index for this model was 0.85. This information will allow more accurate ASCVD risk prediction in FH and will potentially increase the efficiency of care and use of newer lipid lowering therapies. The SAFEHEART-RE is an accurate tool to implement these predictors in daily clinical practice. This e-learning has been developed for healthcare professionals with an interest in FH and genetic testing by a panel of world renowned experts in this area, Pr. Carrie and Pr. Bruckert from France, and Dr. Ballantyne and Dr. Eng in the USA and is approved by the International Atherosclerosis Society (IAS). 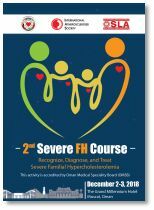 The International Atherosclerosis Society (IAS), the Oman Society of Lipid and Atherosclerosis (OSLA), the Gulf Heart Association (GHA), and the Emirates Cardiac Society (ECS), are happy to make available to our readers some important documents related to the Course on Identifying and Treating Severe Familial Hypercholesterolemia which was held in Dubai, UAE on October 14-15, 2017. The Course was co-chaired by Profs. Raul Santos (President-Elect of IAS), Khalid Al-Rasadi (President, OSLA) and Wael Almahmeed (Board Member of GHA). We would love to hear from our member societies about other such exciting and important successes in the field throughout the world and look forward to hearing from you. We are pleased to announce that after the presentation of the outstanding bids for the ISA2024 Symposium from the Russian National Atherosclerosis Society (RNAS), Emirates Cardiac Society (ECS), Lipid Association of India (LAI), and Oman Society of Lipids & Atherosclerosis (OSLA) the IAS Executive Board during its meeting held in Toronto on June 9 has selected the winner of the ISA2024: the Oman Society of Lipids and Atherosclerosis (OSLA). GUIDELINES A compilation of the guidelines on the prevention of atherosclerotic diseases published by several scientific Societies. These guidelines are readily available in pdf format or Power Point slides. New additions: please check the latest guidelines: Brazilian FH guidelines. CLINICAL TRIALS Abstracts of newly published clinical trials on atherosclerosis and the links to Pub Med, divided by topics and regularly updated. At the bottom of each trial abstract you will find a box where you can write your comments. Please limit your text to max 200 words. Your comments are encouraged. E-NEWSLETTER AND E-LITERATURE The E-Newsletter provides a monthly update of the major activities of the IAS. The E-Literature lists the major articles published in the world's literature pertaining to atherosclerosis. It is a treasure trove of new scientific information. STATIN NEWSLETTER The IAS is pleased to share with its readership this informative Newsletter: The IAS Statin Newsletter. SLIDES The IAS provides slides obtained from previous IAS meetings and co-sponsored meetings. It also links to the slide collection of the Lorenzini Foundation and other organizations that make slides available over the internet. LINKS The website links to a very large number of organizations and government agencies in fields related to atherosclerosis and cardiovascular medicine. It further links to key databases, libraries and journals. VIEW RECENT PAPERS ON ATHEROSCLEROSIS BY COUNTRY Finally, the website includes all recent publications in the atherosclerosis field from each country represented by our member societies. Visit the Member Societies Page (see right panel) and click on the country of your choice. The International Atherosclerosis Society (IAS), incorporated in 1979, promotes, at an international level, the advancement of science, research and teaching in the field of atherosclerosis and related diseases.